Electropolishing is a very unique finishing process. While plating implies adding material such as nickel or zinc, electropolishing does the opposite. Material is removed. 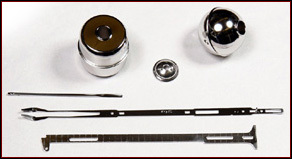 Applications include burr removal, passivation and giving the metal a bright finish. Electropolishing is also unique because it is defined as an engineering specification. Commercial and Government standards may define the process, but the criteria can be different for each item requiring electropolishing. Average material removal is generally .0001-.0002 but can be increased or decreased as specified. Common industries using this finish are medical and surgical instruments, aerospace, marine hardware, and food service equipment. Finally, as mentioned, electropolishing is also a passivation process. Studies have shown, however, that the results far exceed results of passivation alone. Passivation is a process often considered to be a cleaning operation. The cleaning includes the removal of any ferrous particles left on the surface during machining or other secondary operations. Any part made of stainless steel should be electropolished or passivated to prevent any surface corrosion later. of plating and anodizing is rack plate. We can do chemical film in bulk. Rayco Metal Finishing has achieved a reputation of being a short to medium run shop, providing excellent quality and handling of our customers’ parts.